After my recent conversation with Randy Fisher many people have asked me about Habitica as a way to gamify your goals in life. If you are a fan of old school computer RPG’s (Dragon Warrior, Final Fantasy etc.) and are looking for ways to get stuff done. Habitica is a nice little app for just that. 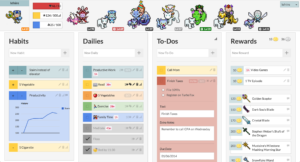 Habitica allows you to set up a character along with tasks of different types that will help you organize the things you want to do or the habits you want to create. You can create habits, recurring to-do’s, or one off to-dos and even your own rewards. One of the best features is the ability to create a party whose task completion or non-completion affects one another. This is a great for accountability. A part can even go on “quests” working together to defeat a monster together by completing their personal tasks. As I’m looking to build Be Better Tomorrow, I have created tasks to help me do this. I have a daily tasks set up to contact my future guests and move forward in setting things up, daily reminders to interact on instagram, weekly reminders to create content for Be Better Tomorrow in one form or another. Apart from being a nice task manager creates a game around your tasks. You earn experience and gold by completing your tasks or building strong habits. This experience make your “Character stronger” and eventually grants them special powers. There are a ton of other features that make this program super interesting to use. There are challenges created by the community for various goals. They are sets of pre-created tasks you accept for a particular goal. These can be as simple as getting up on time with a daily task for that, to a more complex goal that may require multiple challenges. Each of these challenges have reward associated for a person to win if they participate in the challenge. 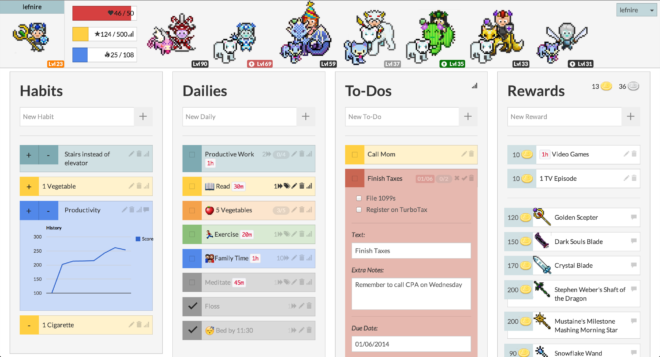 I’ve used Habitica for a few years now and I use it with my children to track their chores. They are able to earn custom reward based on the gold they earn by completing their goals.